"Kale adds flavor and crunch to this tasty chicken pasta dish." Cook raviolini according to package directions. Drain; keep warm. Place 2 Saute Express(R) squares in 12-inch nonstick skillet over medium-low heat until melted; add chicken. Cook, turning once, 5 to 7 minutes or until golden brown and cooked through. Remove from pan. Cover; keep warm. Melt remaining Saute Express(R) square in same skillet over medium-low heat. Add kale, tomatoes and mushrooms; cook, stirring occasionally, 5 minutes or until well coated and mushrooms are softened. Cut chicken into small pieces. Add chicken and pasta to kale mixture; mix lightly to coat. Place into serving dish. Sprinkle with Parmesan cheese, if desired. *Substitute 1 cup your favorite-shaped dried pasta, cooked according to package directions. 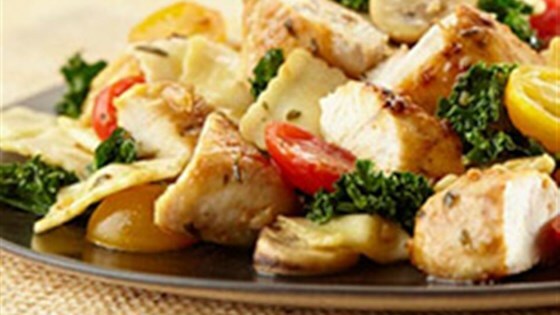 **Substitute 1 pound boneless skinless chicken breasts. ***Substitute yellow cherry tomatoes for all or part of the red grape tomatoes. Tasty. Couldn't find land o lakes squares so substituted 2 table spoons fresh garlic spread sold in Kroger bakery section. Great use for kale from our garden. A keeper. I used butternut squash ravioli and asparagus because that's what I had on hand. My husband loved it and I had some buttermilk marinated chicken and that always makes chicken better?? Made this for dinner tonight. Made just as the recipe stated. It was awesome. Family loved it. Will make again! Made as is with some kale I had gotten in a market basket and didn't know what to do with. Made as written, and my family loved it!